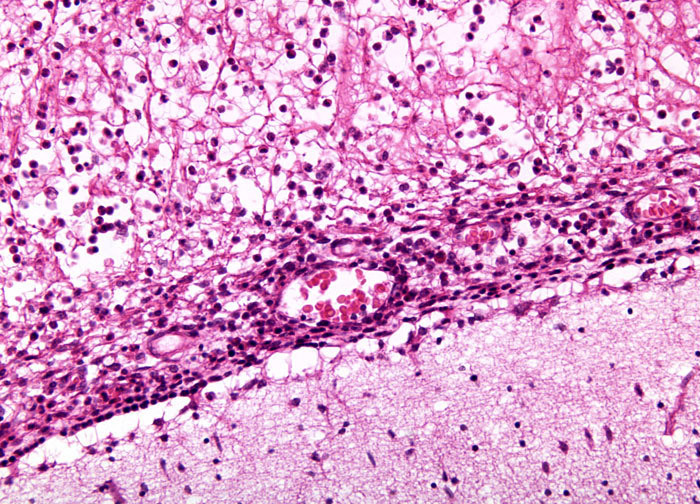 The primary agent that causes acute bacterial meningitis is Haemophilus influenzae b (Hib), but use of the Hib vaccine in the United States has helped decrease its incidence. The misleading name of the bacterium is indicative of the fact that when it was first discovered, it was believed to be an influenza virus. The bacterium Neisseria meningitidis is responsible for the second largest number of cases of the disease. Oftentimes this pathological agent will occur in epidemics. Between 1974 and 1975, an outbreak of meningococcal meningitis in the poverty stricken areas of Brazil resulted in the deaths of more than 11,000 inhabitants and the neurological damage of approximately 75,000 others. Also, in the mid-1990s, the spread of N. meningitidis killed approximately 16,000 people in West Africa. In the United States, the number of deaths each year from meningococcal meningitis is estimated to only be a few hundred, but many more people experience serious long-term effects of the disease, which may include mental retardation, hearing loss, and blindness.